The following links will take you to additional resources where you can add important elements to your martial arts and self defense training. You will find resources for equipment and martial arts supplies, to associate schools, and to recommended sources of information. Add them to your directory and refer to them when you need them. ... if you experience difficulty with any of these partners, including customer service, blind links, difficult site navigation, etc., let us know right away. If the situation warrents it, we will conduct an investigation and decide whether or not to keep the partner's site listed here. Of course, to be fair to our partners, we will always give them the opportunity to correct the problem, both with you personally and generally for future referrals coming from us before removing their listing. Child Safety Resources for Parents at WCI! - Get access to free reports, ecourse, and articles, as well as information about books, videos, seminars and training programs directly from Shidoshi Jeffrey Miller and WCI! Stun Guns for Personal Protection - Website featuring most of today's best non-lethal forms of self defense with hundreds of products to choose from. Self Defense Products - We sell the best airsoft guns and airsoft accessories. Here you can find name brand airsoft guns at super competitive prices. We carry airsoft guns from the following airsoft manufacturers; Soft Air USA, Daisy Air Guns, KTC, KWC, USK, Crosman Corporation, UHC... We enjoy bringing you the best selection of products while offering "top notch" customer service. Martial arts and karate supplies, equipment, weapons and uniforms. The grease that makes all your other training work better. 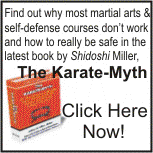 Real self-defense books, classes and videos combining military Close Combat, Internal and External martial art principles, modified Native American Ground Fighting and Point Shooting. Taekwondo and Karate School in Northville Michigan Dan Vigil's Academy of Taekwondo offers excellent martial arts training for all ages. Trade Links with fellow Webmasters. Read informative marketing articles. Visit RecipricalLinks.com today! If you are a site partner, you'll receive special treatment with your link located at the top of the page PLUS it will also be listed again in the general listing. As soon as you have added us to your site, send an email with the URL. Once we have confirmed the link and insured that your site meets our quality standards, etc, we will post your link here.